Thai design agency Hypothesis turned an old industrial warehaouse in Bangkok into a restaurant by using objects found around the site. 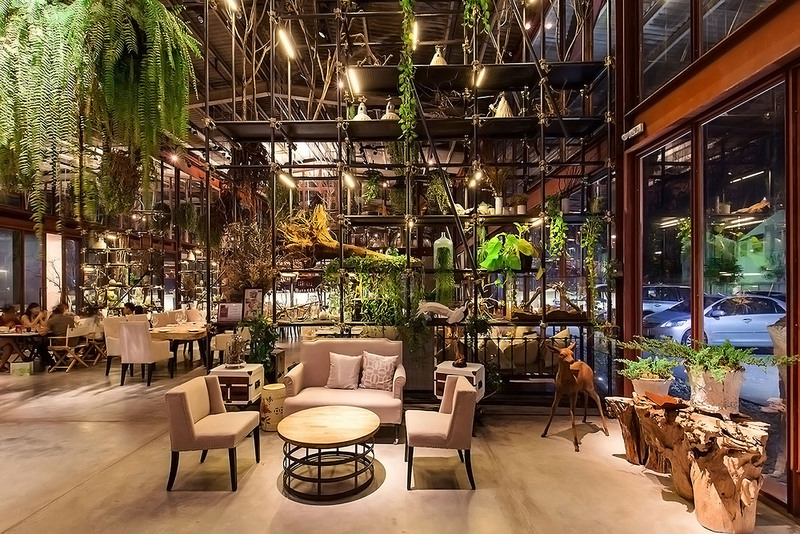 Reclaimed iron doors, steel pipes, dead branches and tree roots were used to create a kind of scaffolding structure and shelves that dominate the interior of the restaurant named Vivarium. The name references the inspiration for the restaurant's design as part eatery, part terrarium. Hypothesis took the idea of a terrarium and applied it to the design of the restaurant. Hanging plants create a lush greenscape that dominates the upper volume of the double height space. Ceramic follies, designed by Yarnnakarn Art and Craft Studio, contrast the rusting industrial setting which reflects the overall theme of the restaurant as a modern container of life. By combining old and new, the architects made sure to minimize the project’s construction cost and allow for adaptive reuse which preserves the historic context of the space. The majority of the original structure was preserved in order to highlight the industrial feel of the former warehouse. Different finishing colors and rust protection primer delineate the old structure from the new addition. The project won this year’s INSIDE award in the bars and restaurant category. Hanging plants create a lush greenscape that dominates the upper volume of the double height space. Hypothesis took the idea of a terrarium and applied it to the design of the restaurant. Ceramic follies, designed by Yarnnakarn Art and Craft Studio, contrast the rusting industrial setting which reflects the overall theme of the restaurant as a modern container of life. By combining old and new, the architects made sure to minimize the project's construction cost and allow for adaptive reuse which preserves the historical context of the space. The majority of the original structure was preserved in order to highlight the industrial feel of the former warehouse. Different finishing colors and rust protection primer delineate the old structure from the new addition. The project won this year's INSIDE award in the bars and restaurant category.